MONTREAL, March 12, 2019 (GLOBE NEWSWIRE) -- Sama Resources Inc. (“Sama” or the “Company”) (TSX-V: SME | OTC.PK: SAMMF) is pleased to announce results from a downhole geophysical survey performed on the first deep drill hole at the 100%-owned Yepleu Nickel-Copper-Cobalt-Palladium Project in Côte d’Ivoire, West Africa. Surface map showing Mise-a-la-Masse results that coincide with the Typhoon’s anomaly wire frame. 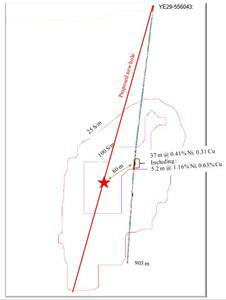 Cross-section for hole YE29-556043 and the projected borehole. The drill target is a conductive body modelled from the Typhoon survey. In the first week of March 2019, the Company conducted a downhole geophysical survey at the first deep hole drilled in December 2018 (YE29-556043). The survey used a geophysical system called “Mise-a-la-Masse” to follow-up on the mineralized intersection announced February 14, 2019. 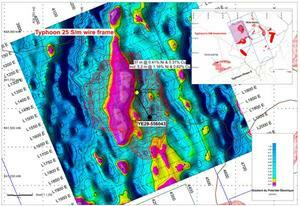 The "Mise-à-la-Masse" method injects an electric current into a mineralized zone intersected by drilling. It aims to assist in delineating the mineralized zone and is based on mapping the distribution of electric potential lines measured on the surface or in boreholes. SAGAX Africa SA based in Ouagadougou, Burkina Faso, completed the survey. Results from the Mise-a-la-Masse survey match precisely with the initial Typhoon™ electromagnetic geophysical survey (“Typhoon”) interpretation in terms of size and location of the conductive target. (please see Figure 1). In order to quickly test the combined Typhoon/Mise-a-la-Masse targets, Capital Drilling will mobilize a second drill rig to complement the one on the current 6,000-m drilling program designed to test high-conductivity targets defined by Phase 1 of the Typhoon survey. The drilling program is targeting semi-massive and massive polymetallic sulphide anomalies located between 600 m and 900 m from surface. The first deep drill hole (YE29-556043) intersected semi-massive sulfide mineralization with a combined 5.2 meter (“m”) intersection grading 1.16% nickel, 0.62% copper, 0.24 gram per ton (“gpt”) palladium and 0.21 gpt platinum (using a cut-off-grade of 0.8% nickel) within a larger interval of 37 m of disseminated sulphide mineralisation grading 0.41% nickel, 0.31% copper, 0.23 gpt palladium and 0.17 gpt platinum. The mineralization encountered in the hole is characterized by aggregates of the nickel, copper and iron sulphides pentlandite, chalcopyrite and pyrrhotite, respectively. Pentlandite occurs together with pyrrhotite, while the chalcopyrite is either mixed with the pentlandite and pyrrhotite or occurs as late millimetric to centimetric sulphide veins cross cutting the pentlandite and pyrrhotite. Contacts between the semi-massive sulphides and the mineralized pyroxenite and gabbroic host rocks are irregular but sharp and often show brecciated textures. This indicates that these sulphide lenses have intruded the host rocks and originated from a source that is yet to be discovered. The first drill rig continues progressing on hole YE45-348726 aimed at testing an electromagnetic response located 3.1-kilometer south-west from hole YE29-556043. The Typhoon response begins at approximately 750m from surface, with a core at 950m, and appears to be open at depth.